There was no change in the U.S. bank prime rate in December, but the Federal Reserve did announce one policy change that could impact some interest rates going forward. The announced change was a small, incremental adjustment. The Fed will go from purchasing $85 billion in long-term bonds every month to purchasing $75 billion. The Fed policy in question was one directed at long-term interest rates. Therefore, it should have more impact on things like mortgages than on credit card rates. Credit card companies left themselves a healthy cushion against rising rates by not lowering rates very much in recent years. Since credit card rates did not fall much in response to Fed policy, it makes sense that they should not rise much in response to a change in that policy. While Federal Reserve policy will have a significant impact on some interest rates, for credit card rates the bigger factors will probably be a) whether there is any improvement or deterioration in credit conditions nationally and b) whether or not inflation remains in check. With no change in consumer credit card rates, the spread between the average rates for rewards credit cards and non-rewards credit cards remained at 2.16 percent. This spread is one measure of the potential additional cost of choosing a rewards card, but the other key variable is the size of the balance a consumer typically carries on a card from month to month. The lower that balance, the less the actual cost of the rewards program, and if a consumer pays the card off in full every month, the interest differential costs that consumer nothing. Any cost of a rewards program should be weighed against the value an individual consumer is getting out of that program. This is a function of how regularly the consumer cashes in accrued rewards, and what the actual economic value of those rewards is. Students with credit cards can rest easy over the winter break from school -- there has been no change in student credit cards since September. After one change in the availability of credit card offers tracked by this survey in early December, business credit cards were stable in the second half of the month. 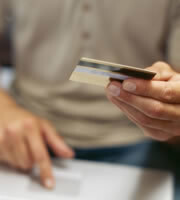 This leaves the spread between the average rates for rewards credit cards and non-rewards cards at 0.57 percent. This is much smaller than the rate premium for consumer rewards programs. With no change in any of the credit card offers tracked by this survey, the difference in rates offered to consumers with excellent credit and those offered to consumers with average credit remained unchanged, at 3.93 percent. As with all credit card interest rates, the relevance of this rate differential is largely a function of how much of a balance consumers carry on their cards from month to month. Since people with poorer credit tend to carry higher credit card balances, the impact of this rate differential is likely to be amplified by those higher balances in most cases. 0 Responses to "Credit card rates stable despite Fed policy change"